Abused horses are sadly very common because it is a lot easier to make mistakes with horses than it is to take the time to find solutions to problems which may arise in the course of the training process. Abused Horses: Why does It Happen? 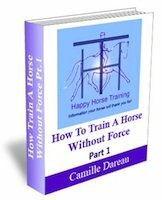 Difficult horses tend to become abused horses because training horses is a challenging process at the best of times, and there are many more horses around than sympathetic, experienced trainers. Unfortunately the common misconception is that most of the reluctance to comply with our wishes encountered when working with horses, is a consequence of horse psychology i.e. either 'he doesn't want to' or 'he doesn't understand'. This is a serious misunderstanding of the consciousness of a horse. As humans, unless we make a significant effort to transcend them, we have a fairly continuous stream of thoughts running through our minds all of the time. We tend to either mull over past events or plan the future. When we get tired of this, we like to escape into a form of distraction like a book or the TV. It is because we are so used to our own mental processes that we project them onto our horses as well. Of course none of us knows what a horse's perception of reality is really like, but we can make some intelligent deductions. We know horses don't intellectualize like us, and their nervous system has evolved in such a way that they specialize in sensory perception. Put simply they feel rather than think. Relate this to when you are riding and your horse doesn't want to go forward, there is not a thought process whereby he thinks 'I could be finishing my hay-net at this point' or 'this makes no sense, can you just repeat that last bit', in fact he very probably doesn't go forward easily because, for some physical reason, he finds it easier not to. He would be labeled as a lazy horse by many trainers, but we have yet to come across such a horse. Horses are flight animals after all, truly lazy ones have probably been weeded long ago out by the natural selection of horse evolution! Unfortunately when human thinking is projected onto horses, the result is a lack of understanding of the real problems horses may experience, which prevent them from fulfilling our wishes. The consequence of this is a high percentage of abused horses filtering through the system. Abused horses are simply horses which have been pushed beyond their own boundaries either too many times, too violently, or both. The vast majority of such abuse happens as a result of lack of understanding. Most people would (hopefully) be horrified if they could feel how bad a lot of horses are feeling when they are being ridden - whether it be from, for example, headaches or aching joints, twisted necks or sciatica. All living creatures have 'boundaries'. These boundaries are how we protect ourselves from negative experiences such as pain and loss. Again, as humans, our boundaries can manifest in the intellectual realm as well as the sensory. We have beliefs and philosophies and ideas. 'Open-minded' people have less limitations in their outlook. Limitations can be seen as the same thing as boundaries. Horses may not have boundaries like that, but their physical and energetic boundaries are more sophisticated than most people can conceive of. One feature of abused horses is that their boundaries seem to be 'faulty'. This may be because they have been ignored to the extent where their boundaries become accentuated i.e a stressed horse is much less 'biddable' than a happy horse. He will be less easy to handle and usually less rideable as well. Forcing a horse's boundary means not accepting the horse's estimation of a particular situation. For example, if someone was leading a foal away from her mother, and the foal baulked and didn't want to go, if they ignored this boundary she had set up and continued to try to force her, then she would be traumatized by that experience. This young horse is being introduced to the clippers for the first time, in a way that respects his boundaries, and therefore avoids traumatisation. What Happens to Abused horses? It is likely that the majority of abused horses 'internalize' the stress response they felt every time they were forced to do something. They were given no choice, and most horses will accept their situation partly because survival instinct is very strong in horses. They can go on for years and years carrying out the functions people want them to perform without complaining. The down side is that, like the myth when someone comes back from the dead - they are like zombies. Physically you might simply describe this state as a 'stiff horse' and mentally you could say 'he doesn't have much personality'. 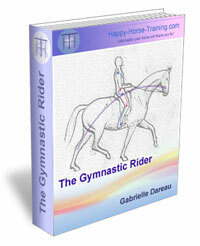 The supple horse with a personality is still in there, just hidden under layers and layers of tension. This scenario is seen very often in a riding school horse. 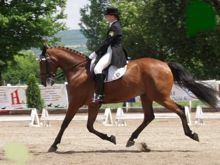 It takes a serious level of sensitivity and consciousness on the part of the handler and rider of a horse to perceive these boundaries and support them, although there are many children who are far more capable than adults in this regard, the main drawback of riding schools is the lack of personal relationships. 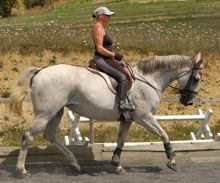 The particular rapport you establish between you and your horse is an important part of the training process which is often not available to riding school horses and ponies. On the other hand there are horses who may find the riding school life easier because of that very impersonality. They may not be ready for a one to one relationship with a person on that level. The abused horses who don't compensate in this way will end up either in a meat lorry, abandoned, or rescued by someone. Sometimes they may have very few further demands made on them, and sometimes they will be rehabilitated. 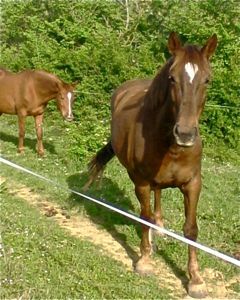 The reason that some horses compensate and some don't comes down to their personal choice, but it might manifests externally as physical problems that were too serious or painful to hide away, or maybe they were in a circumstance where their rider was not strong enough to force them to accept the rules. What Is the difference between an Abused Horse and a Problem Horse? Training horses would be a lot easier if all horses truly were 'clean sheets' at the outset of their careers. Like people though, they are all unique individuals with particular mental and physical characteristics from birth. Also, like people, all horses have a 'pattern' (see: What Does Horse Healing Mean?) made up of all the physical and emotional blockages from birth at least, maybe earlier. Certainly horses can be born with some serious issues which would be difficult to relate to their life experience up to that point. The question is how these issues are addressed of course. A horse with problems is not always an abused horse, and the main difference comes down to trust. Abused horses have had their trust in people damaged. Trust can be thought of as credit, like money in the bank. You build it up and sometimes you have to use some of it up, but a healthy buffer is always preferable! 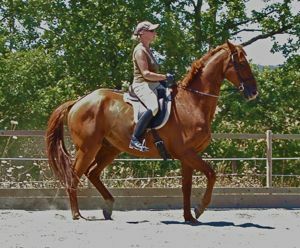 With abused horses the trust balance is usually somewhere in the red, and before any actual training progress can be made, the trainer of that horse has a lot of work to do to reestablish the connection. You can't make any demands until there is credit in your trust account. The other way of looking at this is that you have to allow the horse to rebuild his own boundaries. He has to have a period of having just about any boundary he makes respected... until boundary means boundary in his mind. Any time you and your horse are not in accord about something, there is a boundary there. If you can become conscious of your horse's boundaries, then you will be connecting with your own too. Boundaries meet each other, like the blobs of oil in a lava lamp. Boundaries are energy, like everything, and they can be more or less 'physical' i.e lower or higher frequency. What constitutes a boundary is up to each individual person to define in their own mind. 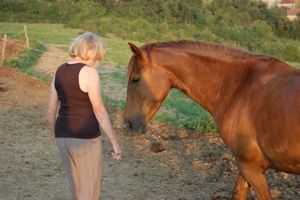 The more sensitive we become, the more we will be aware of the different ways we are connecting with our horse. This connection is as multifaceted as a diamond, and each facet can be seen as a boundary which can be listened to and supported, or ignored and pushed through. Space - proximity between you and the horse. Comfort - level of physical well-being or pain felt by horse. Displacement - moving a horse from one place to another. 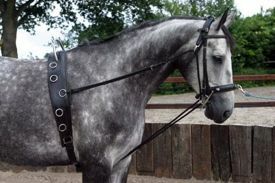 The horse is tacked up with lungeing equipment including a lungeing cavesson on which is designed to be stay steady on the nose bone, so the straps don't pull into the horse's eyes. However a strap is also attached which goes under his chest at a length which prevents the horse from relaxing his neck voluntarily. 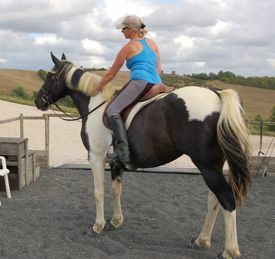 This horse already has spinal restrictions which prevent him from rounding his top-line in the correct way and this is why the auxiliary aids are attached. The problem is, of course, that he doesn't stretch his top-line in the first place because it is painful for him to do so. 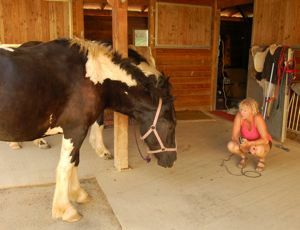 Forcing his neck to take up this shortened posture then aggravates further his 'broken neck' (horsey terminology for the incorrect flexion of the neck at the third cervical vertebra), and this is abusing his comfort boundary the whole time it is in place, more intensely the longer the session goes on, as well as stressing his joints because they are straining to relieve the pain. Beside this boundary intrusion, getting into this horses space without sensitivity seems a minor concern, but the fact that the horse is rendered so vulnerable by the fact that he can't use his self defense mechanisms is a particularly important abuse of his boundaries. Add to that making him move with the lunge whip, forwards, sideways and backwards within the same fixed posture, and he doesn't have many boundaries left. 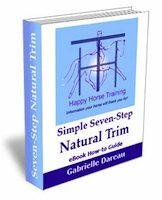 Many people believe that this is how to train horses, and it is traditionally accepted in many countries that training is forcing boundaries - otherwise the horse might have a different opinion. If the goal is more important than the horse, then the relationship will forcibly boil down to one of master and slave, however prettily we dress it up. It is only when you care more about your horse (and ultimately your own integrity) that this will not fulfill you anymore. Respecting boundaries means being prepared to enter a dialogue with your horse and allow him to decide what he can manage with his body. It is a difficult and demanding process with most horses, but the payback has a value beyond words. Balance - the effect of the riders weight on the horse's balance. Physical comfort - level of physical well-being or pain felt by horse. Mental comfort - state of mind of horse, calmness or anxiety. The riders pelvis is tipping forwards into a fork seat, this is setting her seat-bones against the movement of the horses back and because he therefore doesn't feel comfortable lifting his back, he tries to slow down. The rider's spurs then cause pain in the horses sides. So after only a few strides, the horse's balance boundary is being ignored, because he is being made to move when his body balance tells him to stop, and his physical comfort boundary is being forced by the spurs. This then stresses his mental comfort boundary and he starts to become anxious. His natural flight response may then kick in as a result of both comfort boundaries being under stress, but he runs into the curb bit and snaffle combination and then experiences discomfort and probably pain both in his chin from the pressure of curb chain, and in bars of his mouth. This is the most serious transgression because his ultimate safety (being a horse) lies in being able to run away from threat, so he continues to try to run every stride. He drops his back further because the riders seat-bones are continuing to make it difficult for him to lift comfortably, and he can only lift his back anyway when his neck telescopes correctly (carrying itself in a stretching arc). His neck at this point is rigid and compressed. This hollowing posture gives his paces a kind of artificial tense swinging motion which puts a lot of stress on his joints, infringing his comfort boundary again, as well as the worsening pain in his back and neck. Sadly this image of controlled tension and struggle is exactly what dressage judges seem to be looking for in competitive circles. It is a hideous caricature of the poignant beauty of a horse and rider whose boundaries and therefore consciousness are aligned, but it is reproducible in a fairly reliable way in a dressage test scenario. Incidentally the warm-blood breeds commonly used for this purpose do tend to have less sensitive boundaries than say a pure thoroughbred would, which adds to the reliability factor. Comparing at these two pictures, can you see in which one the rider is respecting the horse's boundaries, and in which one they are being disrespected? The other culprit responsible for so many abused horses is neglect. When we don't provide horses with the environment they need to be happy and healthy i.e the right food, friends and lifestyle, then it is an indirect infringement of their boundaries, more like an inability to support their boundaries as opposed to pushing right through them. This is the key in fact, to connecting with a horse, and in effect melting the boundary between you, so that there is no longer a question so much of control, but of trust. This subject is further discussed on the Rider Communication page. A neglected horse which has maybe been starved or left without shelter or attention may be easier to handle and ride when her physical health has been restored, but abused horses of this kind are unlikely to be without emotional issues as a result of being abandoned. Such a betrayal of trust is very profound because it concerns the fundamental requirements of life. As is usually the case with the rehabilitation of abused horses, the process of healing the breach of confidence will become the responsibility of the rescuers even though they were not the perpetrators. Horses like people cannot necessarily make this distinction because their sentiments are not logical, so much patience is required and resolve not to take resentment or coldness on the part of such a horse personally. These two mares (above) both came to us having been neglected at some stage previously. With a happy lifestyle they are now regaining their trust in people.